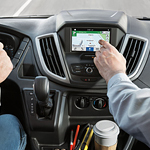 The available FordPass app gives you the tools that you need to seamlessly go about your day while on the road. This app allows you to compare local fuel prices, find parking at your destination, schedule maintenance service on your Transit, and much more. Audio enthusiasts will appreciate the complimentary six-month subscription to SiriusXM satellite radio. This package delivers more than 150 channels of music in every genre, news, comedy, sports radio, and more. You will be endlessly entertained in your Ford Transit.